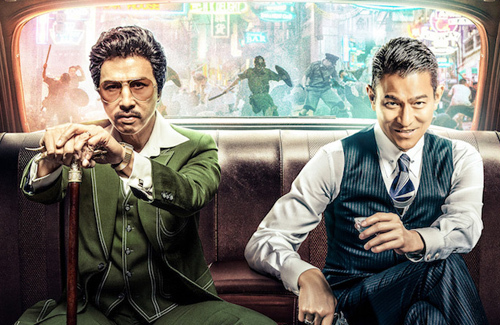 In theaters now, Chasing the Dragon <追龍> marks the first film collaboration between Donnie Yen (甄子丹) and Andy Lau (劉德華). A remake of 1991’s To Be Number One <跛豪>, Andy portrays corrupt police officer Lee Rock, while Donnie plays drug lord Crippled Ho. Besides Donnie, who dropped his Ip-Man image to take on the challenges of playing a drug lor, director Wong Jing is also hoping to make a breakthrough with Chasing the Dragon. Known for his crass and over-the-top films, Wong Jing’s last film From Vegas to Macau 3 <賭城風雲III> was criticized for its weak script despite the star-studded cast. Wong Jing’s movies keep having stars in it but very questionable scripts. I know he films very quickly so does he purposely choose poor scripts so he can film them all very quick? It seems like a waste of star power with top artists he gets all the time in his films. @mike Wong Jing has done some good movies outside his brainless comedies, mainly crime movies with frequent collaborator Billy Chung. Movies such as A True Mob Story, “My School Mate, the Barbarian”, the first two “Colour” movies, “Moving Targets”, “I Corrupt All Cops”, and “To Live and Die in Mongkok”. He can get ambitious when he wants to be. This looks like another ambitious one if you ask me so I really want to see it. Can we stop using the word ‘dragon’ in movie titles?